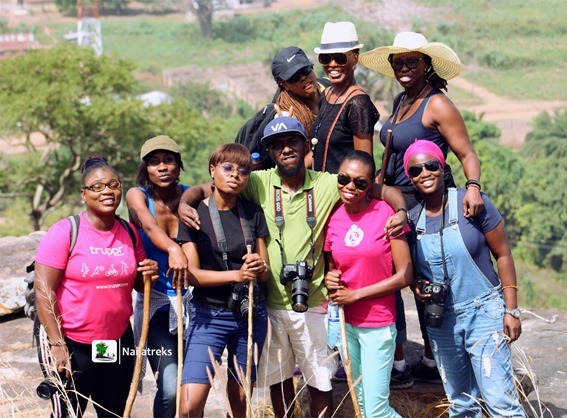 The Hike to the top of Oke Ado mountain, a Naija Treks adventure. I always mentally plan a road trip and for one reason or the other never get to actualize the plan(side eye to my ever disappointing and forever cancelling friends). The moment I saw the ad by NaijaTreks on instagram for this trip, I knew wouldn't miss it despite the fear it might fall during my exams. A friend confirmed and I made up my mind. The trip started quite late, I had to wait at Berger bus stop for over 45 mins (I was a bit pissed, because I practically jumped out of my bed thinking I was late). The tour coordinator was so sweet apologizing that I totally forgot about It. 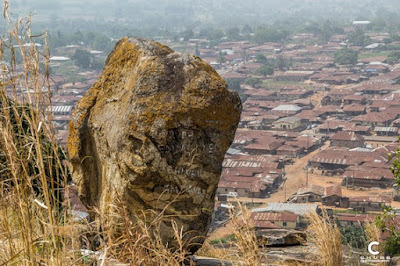 The ride was through Abeokuta, we had to pick up my friend who was attending the Ake festival. The ride down was almost uneventful, with small chats here and there and everyone sticking to their own tiny group. We got to introduce ourselves, and the atmosphere improved. I loved the diversity of the group with our varying travel experiences. We got to share our various travel experience, Dolapo seems to have more African Travel experience. Funny, we all might not have met before except for one or two people but we all had one person who we knew in common. It definitely is a small world. After a few wrong stops, we located the mountain. We met Pa Adedriran Adesegun, the custodian of the mountain. He was not available to take on the mountain hike due to old age, but he assigned a young lady from the town named Victoria as our guide. Hiking Sticks were provided which unfortunately did not go round and some of us had to climb the mountain unaided. The climb up the mountain was not an easy one, let's just say asides from the tour coordinator none of us was fit for the climb. We kept taking breaks, and asking ourselves who sent us message to climb mountain. After countless intermittent stops, we made it to the first point. We climbed a total of 369 broken and uneven steps before the first point. The Ishagi rock, a mysterious boulder which stands on the mountain with no visible form of support. The journey continues to the top of the mountain where we saw the suspended lake known as the Ìyàké Lake. The lake which is believed to be the god of fertility is a greenish pool with shrubs growing around it. We had been warned by the villagers not to attempt to dip our feet in the lake, for it is forbidden to swim or bath in the lake. Rumor has it that those who failed to heed the warning, drown and their body is never discovered. However, the villagers make use of the water from the lake. Our guide, Victoria filled a plastic bottle with water from the lake, took a sip and went home with the rest. Upon our descent from the mountain, we made our way to Igbo-Ora town renowned for its multiple twins birth. We were unfortunately unable to see some of the twins as some where either not home or were to shy to interact with us. For me, I couldn't be bothered. I was hungry and too tired. We went in search of food, everyone wanted to taste the famous 'Ilasa' soup which is believed to be responsible for the birth of twins in the town. 'Ilasa soup' turned out to be a soup made with okra leaf and mashed egusi. It actually looks like the 'ewedu' soup found in most bukas, I ended up not tasting the soup for whatever unconsciously reason of mine. In all it was a really good trip. Not just for the hike but for the beautiful minds I met. I am used to travelling with closed group of friends and I was glad I took that leap, if not I wouldn't had such a beautiful experience. Such beautiful adventure; lovely pictures. I think this is so cool, I've always wanted to road trip around Nigeria but my parents never agree. What a great adventure, nice pictures too. Nice post!!! I am climbing this mountain with @UnraveillingNigeria. I felt that way ("Who sent me message") when I did the canopy walk at Lekki Conservation Center. I am so not doing that walk ever again.